The CBIR is located at the Spring Grove Hospital Center. 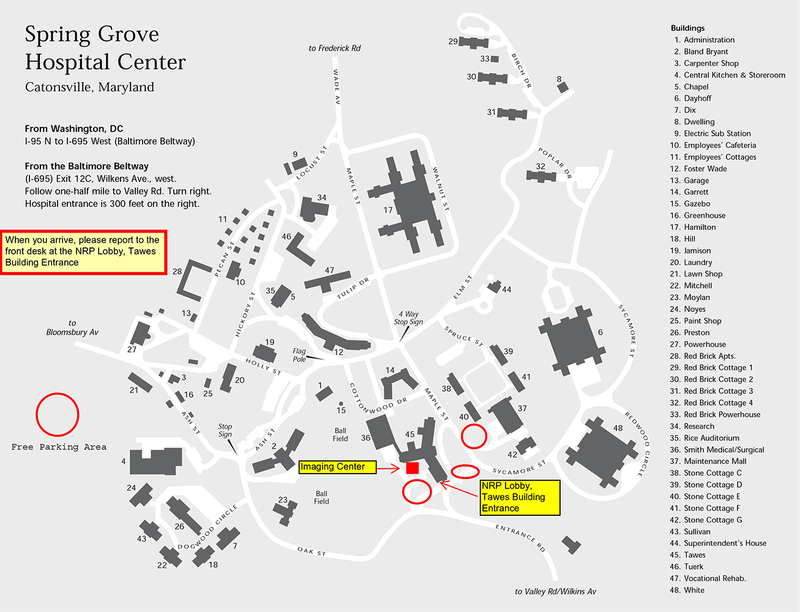 We have provided written directions and a link to Google Maps below to aid you in reaching Spring Grove Hospital, but we ask that you use the campus map provided to find us once you have reached the grounds. When you arrive please report to the front desk in the NRP lobby, located on the ground floor of the Tawes building. From the Northern Baltimore Area: Follow the Baltimore Beltway, I-695, South and West to Exit 13, Frederick Road. At the end of the exit ramp, turn right onto Frederick Road and take an immediate left onto to Wade Avenue (The McNabb Funeral Home is located on the corner). Follow Wade Avenue for approximately 0.25 miles, at which point it leads directly into the campus of Spring Grove Hospital Center. From the Southern Baltimore Area: Follow the Baltimore Beltway, I-695, north and west to Exit 12C, Wilkens Avenue, west. At the bottom of the exit ramp, turn right onto Wilkens Avenue, proceed through the traffic signal, and follow Wilkens Avenue for approximately 0.5 miles to Valley Road. Turn right onto Valley Road, and in approximately 500 feet turn right again into the entrance of Spring Grove Hospital Center. Follow the entrance road up the hill and onto the grounds of Spring Grove Hospital Center. Bear left at the fork in the road. From Metropolitan Washington, DC: Take I-95 North towards Baltimore. Just south of the city take the Catonsville exit, marked I-195 and Route 166. Once on the exit ramp, bear left onto Route 166. Follow Route 166 for approximately 3 miles until it ends at Rolling Road. Turn right onto Rolling Road and, at the first traffic signal, turn right again onto Wilkens Avenue. Follow Wilkens Avenue for approximately 1.5 miles to Valley Road. Turn left onto Valley Road and continue for approximately 500 feet to the entrance to Spring Grove Hospital Center, located on the right. Follow the entrance road up the hill and onto the grounds of Spring Grove.